Welcome to this friendly and informal family run holiday park of about 10 acres, set in a rural location with views of the surrounding forests, hills and heather moors, yet conveniently located only 8 miles south of Inverness. Our accommodation choices include 10 static caravans and 1 chalet for holiday hire, as well as pitches for touring caravans, motorhomes and tents. 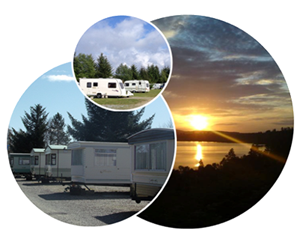 We also have pitches available for privately-owned static caravan holiday homes, for your own personal Highland getaway! Whether for an overnight stop, short break or longer holiday, we hope Auchnahillin will provide the ideal choice for your Highland visit, and look forward to welcoming you. Please do not hesitate to get in touch if you require further information or wish to make a reservation. NO vans or commercial vehicles, workers or residential. currently available for sale on or off site.